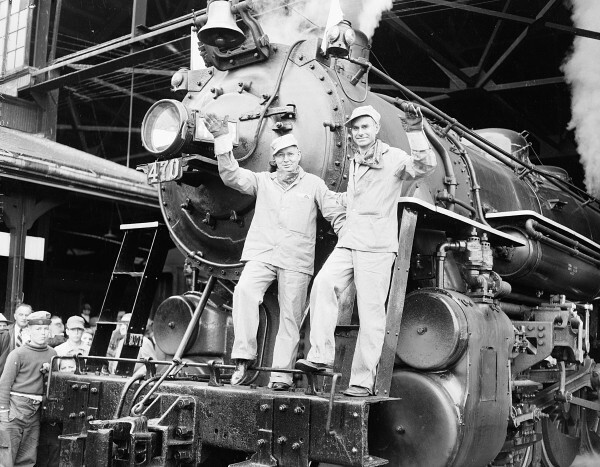 Governor Burton M. Cross, left, and E. Spencer Miller, president of Maine Central Railroad, wave from the front of Steam locomotive 470 at Union Station in Bangor in this June 1954 file photo. 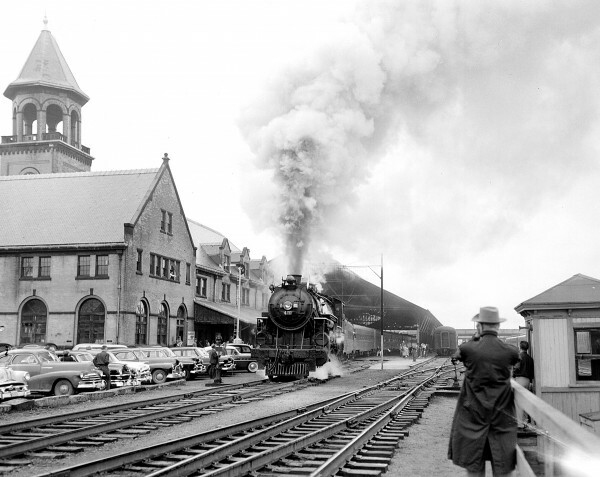 Steam locomotive 470 chugged into Union Station on Sunday marking the last visit to Bangor of a Maine Central steam train in this June 1954 file photo. ELLSWORTH, Maine — An old steam engine that was built in 1924 and used by Maine Central Railway until 1954 may soon move from its decades-long resting place in Waterville to Ellsworth. On Tuesday, Dec. 3, the Waterville City Council voted 3-3 with Mayor Karen Heck casting the deciding vote in favor the sale of the locomotive to the nonprofit New England Steam Co. for $25,000, according to the nonprofit’s president, Richard Glueck. Councilors were divided between keeping the Waterville landmark in their city, while running the risk of seeing it fall into further demise, and letting it be moved to a place where it might have a better chance of being refurbished. “It belongs to the citizens of Waterville, and it’s a part of their history,” said City Councilor Fred Stubbert in a phone interview. But the engine, known as Maine Central No. 470, needs work, and the city of Waterville does not have the funds to immediately repair it. City Manager Michael Roy could not be reached for comment on Friday, but he told the Waterville Sentinel, “I think we realized that may have been unrealistic to have it remain in this area. “We did not see the city as having the resources to dedicate to the repair of the steam engine,” he said. Under the terms of the agreement, the group will have two years to raise the funds to purchase the engine. Then it would have another year to move it to Ellsworth. The New England Steam Co. intends to “repair, restore and rebuild the locomotive to create some job opportunities and some job training in the area,” according to Glueck. The engine would be relocated to Downeast Scenic Railroad’s facility at Washington Junction where it would be restored to a usable condition. Glueck envisions tourists being able to ride the train someday, much the way they can now ride the steam-powered trains between Ellsworth and Ellsworth Falls. Downeast Scenic officials are enthusiastic about the partnership. Glueck believes the train will be a boon to Ellsworth’s economy. “We have research that shows that an operating steam locomotive in a prime tourist area brings an additional 10,000 additional visitors to the area each year,” said Glueck, referencing the Strasburg Railroad, which carries tourists on a 45-minute ride through the Amish countryside in Pennsylvania, according to its website. “We believe we can bring in multiple thousands. I’m not sure about 10,000,” Glueck added. Maine Eastern Railroad in Rockland also has expressed some interest in operating the steam engine seasonally, Glueck said. But the New England Steam Co. has a long way go before the engine is motion again. The group estimates that it will cost between $1.3 million and $1.75 million to repair and relocate the 470. The first step will be to remove all traces of asbestos and lead paint, which Glueck thinks will cost about $40,000. Moving it to Ellsworth will be another $80,000, according to the group’s business plan. So far, members have only raised $5,000. That’s another reason Stubbert was opposed to the agreement. The engine was originally given to the city of Waterville as a gift because it was the location of Maine Central Railroad’s maintenance shops, Stubbert said. The city put out a request for proposals to have it refurbished about two years ago. Glueck’s group was the only group based in Maine that wanted to take on the project. His nonprofit has started an indiegogo site to raise money and is soliciting restaurants and breweries to market an item on their menu as a No. 470. Proceeds from the sale of that item would go to the nonprofit and the businesses would a get a tax deduction in return. If the group is unable to raise the $25,000 to purchase the engine within two years, the agreement will become void.